As the mom of a beautiful 4 year old girl and expecting #2 in January, I am always on the lookout for new products. I love discovering new products that I can use and that other moms will love as well. Recently I discovered Need Brands. Need Brands was created by Tia and Tamera Mowry, the famous twins that many of us thirty something moms grew up watching on t.v.! As they started their own families, they had similar concerns to most moms. Breastfeeding and producing plenty of milk to feed their little ones was a big one! They decided to create a tasty, effective product that could increase milk production, be healthy for mom and baby and be affordable too! From this idea, they came up withMilky! Milky is a natural, organic lactation herbal tea supplement. 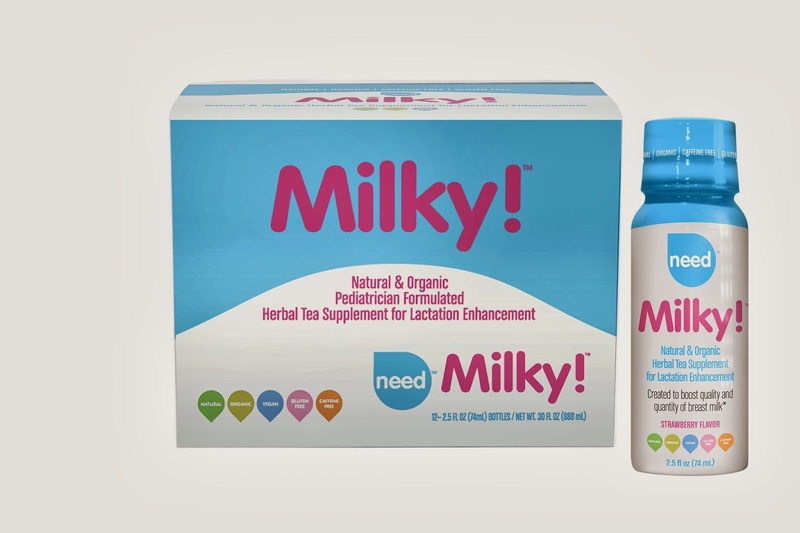 It promotes lactation without having to go through the trouble of brewing hot teas throughout the day and it was designed by a pediatrician to help boost the quality and quantity of breast milk. Some of the main ingredients are fenugreek, fennel, ginger, chamomile and rooibos. Unlike teas you have to prepare at home, you can take Milky! with you in the convenient bottles they are packaged in and drink them on the go. They will make for a healthier lifestyle for you and nourish your baby too! One of my favorite aspects of Milky! and all of the Need Brands products is that they are all vegan and are not tested on animals. They are also all eco-friendly and they are scientifically proven to work. So, do you want a chance to win your own box of Milky!? It includes a 6 day supply and it is valued at $29.99 plus $5 flat rate shipping. Below are the rules to enter and a 10% discount code for all to use as well! Contest begins September 25, 2013 at 12 am and ends September 29, 2013 at 12 am. Get started and win yourself a box of the best breastfeeding supplement around. If you would like to order a supply of Milky! in advance, enter NICK10 at checkout to receive 10% off your entire order of 2 boxes or more. I was not paid/compensated in any way to test/review this product. Welcome :) Love being able to do giveaways for products I really believe in! A review is great but being able to give something for free is even better!! I have always wanted to try milky! Thanks for the giveaway! Welcome :) I've heard amazing things about it. Hope you win and get to try it. If not, use the promo code above for a discount on it! hey are u guys going to do a giveaway for stretchy???? Yes we are! That's coming up next week ;-) Stay tuned. It'll be announced on Facebook and Twitter so follow us to get first dibs on entering. Remember you can enter every day by tweeting about it! And you get points for commenting on the blog as well ;) I've been using Stretchy daily and love it. It smells amazing and feels so soft on your skin! I plan on using it as a regular moisturizer after pregnancy as well! And I would love everyone to win just to be able to try it! I'll be doing a Stretchy giveaway next week too so stay tuned! I'll also look into at least getting samples of Milky! and Stretchy for those that don't win. These products are too good not to try. Several friends have tried Milky! and say it works better than the tea.